A mind map is a diagram used to represent words, ideas, tasks or other items linked to and arranged radially around a central key word or idea. It is used to generate, visualize, structure and classify ideas, and as an aid in study, organization, problem solving, decision making, and writing (from Wikipedia). I love mind mapping. It gives you the chance to brainstorm your ideas, free from the limitations of linear thinking (that can come later) and helps you generate a “birds eye” view of your project. I use it regularly – when planning and developing courses, writing books, planning projects, studying and revising etc. It can also be used to help with planning trips, office relocation – or even your Christmas festivities (or any other festivities)! In fact anything that requires planning and organisation could benefit from a mind mapping approach. And then, just when you didn’t think it could get much better, you can export your mind map into Word, PowerPoint or Project to help you get a head start on your reports/minutes, presentations and project plans! Fantastic! In MindGenius the Getting Started guide is displayed when you launch the application. To get a feel for this application, or to learn how to use it, take a look at the MindGenius videos. To find out how to get your personal copy of MindGenius see Software for personal use on the IS website. If you are on the Edinburgh campus you might like to come along to a Mindmap with MindGenius Power Hour – on Thursday 16th October at 13:15 or Thursday 13th November at 12:15 in the Anderson Room (Cameron Smail Library). 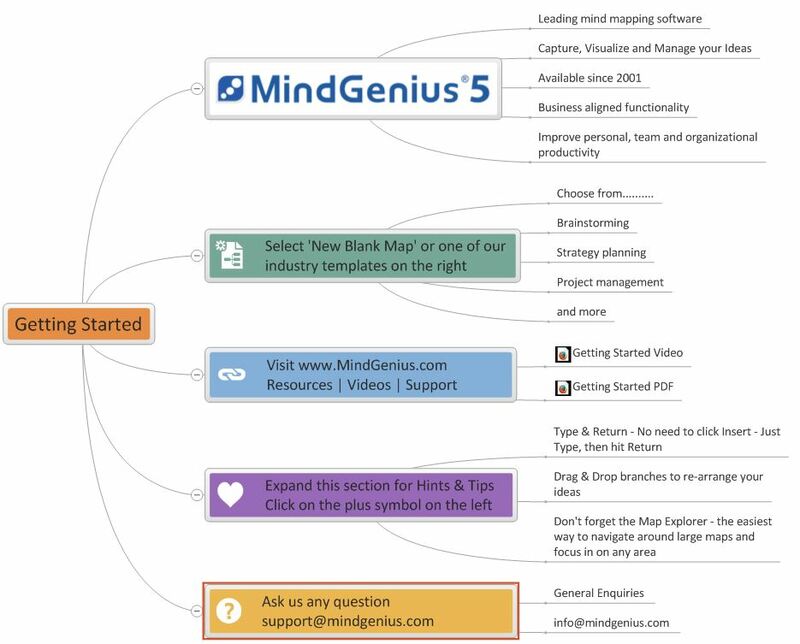 There are 2 Mind Mapping applications on the HWU desktop – Mind Genius and Inspiration – and both have good online tutorials and support pages to help you get started.